President-elect Donald Trump’s transition team is exploring widespread changes at the Department of Energy and asking which employees and contracts were involved in climate-related meetings, according to a document obtained by E&E News. Photo courtesy of U.S. Department of Energy. This story was updated at 4:28 p.m. EST. 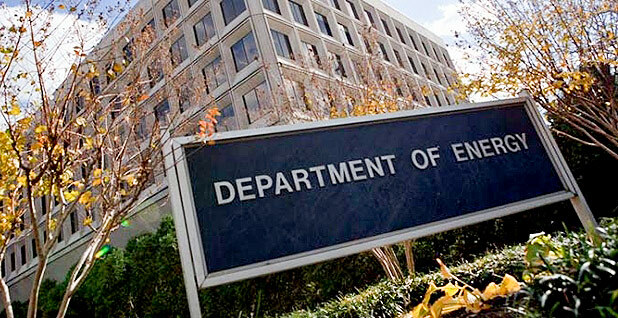 President-elect Donald Trump's transition team is pondering wide-scale changes at the Department of Energy and zeroing in on employees who may have helped advance the Obama administration's climate policies, according to a landing team document obtained by E&E News. Trump advisers, according to a list of 74 draft questions being circulated by the transition team at DOE, are peppering the agency with questions about the nation's multibillion-dollar loan guarantee program, the validity of work at the U.S. Energy Information Administration and which programs are critical to the president's climate agenda. Advisers also appear to be researching which employees or contractors attended any of the Conference of the Parties under the U.N. Framework Convention on Climate Change or interagency working group meetings on the "social cost of carbon." One career staffer who asked not to be named said the questionnaire looked like a "hit list" and called the focus on past attendance at specific meetings troubling. "It makes me incredibly uncomfortable and concerned," the staffer said. "There are some questions about staff that seem completely unnecessary — like asking only for staff that have attended meetings [when there are] not even registration lists." DOE officials would not comment on the document, but two sources close to the transition effort said the questionnaire is authentic. At least 15 of the questions within the form are dedicated to EIA, the agency's statistical arm known for generating its web of energy data into short- and long-term predictions of how markets will move. "EIA is an independent agency in DOE. How has EIA ensured its independence in your data and analysis over the past 8 years?" advisers asked in the document. "In what instances do you think EIA's independence was most challenged?" The staffer said the transition team's questioning of EIA was worrisome. EIA is "incredibly independent and most often are pretty reserved in their analysis, but take up a huge portion of the questions," the source said. While in draft form, the questionnaire hints at Trump's plans for the Department of Energy, including downsizing, reviving the long-stalled Yucca Mountain nuclear waste repository, finding ways to keep at-risk nuclear reactors operating and shelving programs aimed at bolstering renewable energy research. With 158 political appointees, the agency oversees the nation's sprawling labs, the nuclear arsenal, and more than 13,000 employees and contractors. Energy insiders trying to read the tea leaves have pointed out the transition effort is being led by Institute for Energy Research President Thomas Pyle, who in the past has called for scrapping the loan guarantee program and offices within DOE to save money (E&ENews PM, Dec. 2). Trump advisers also asked whether there are any statutory restrictions to reviving Yucca Mountain, a position possibly fueled by Jack Spencer of the Heritage Foundation, who is also on the transition team (Greenwire, Dec. 6). Reports about the transition document prompted an immediate response from Democrats in the House and Senate and green groups. Democratic Sen. Ed Markey of Massachusetts in a letter to Trump said any attempt to demote, sideline, terminate or otherwise discriminate against federal civil servants for attending climate-related meetings would violate federal law that protects employees against "such wrongful acts of retaliation." The Office of Personnel Management, he added, sets clear guidelines on employment decisions regarding federal employees. Rep. Frank Pallone of New Jersey, the top Democrat on the Energy and Commerce Committee, issued a statement denouncing the questionnaire, calling the effort a "witch hunt and a loyalty test" rolled into one. "This environmental McCarthyism is dangerous and should not be tolerated," Pallone said. "The transition team should reconsider these apparent attempts to intimidate Energy Department employees who were simply working to fulfill the climate objectives of the Obama administration." Sierra Club Global Climate Policy Director John Coequyt echoed that sentiment. "It looks like Trump and his administration are planning a political witch hunt which has no place in American government: purging or marginalizing anyone who has worked on the issue of climate change," Coequyt said in a statement. "And that's at the same time they are looking for ways to eliminate the very scientific infrastructure we need to monitor changes to our planet and its climate." The Nuclear Energy Institute also weighed in about the importance of federal involvement to stave off plant closures. The industry has seen a string of premature closures in recent years as operators struggle with cheap gas, low demand and rising costs. The Trump team questioned what could be done to save the plants. The industry group appeared to spotlight a statement in the transition team's question about what could be done to prevent premature closure of U.S. reactors. While state solutions for at-risk plants are cropping up in New York and Illinois, the lobbying group said those are only a "bridging strategy" to larger fixes that are needed. "For the long-term well-being of our nation, nuclear energy must be recognized as an essential part of America's industrial and electrical infrastructure," NEI's chief operating officer, Maria Korsnick, said in a statement. The team is also seeking information on what mechanisms exist to help national laboratories commercialize their scientific and technological prowess. One source close to the transition effort said Trump's team is meeting with leaders from all 17 national labs Wednesday.